Looking to sail from Jezera? Search to find and book your ideal boat, or read everything you need to know: prevailing winds, where to sail, how to get there and more! You'll fall in love with Jezera, an idyllic ex-fishing village on a quiet island, surrounded by impeccable beaches. From here, there's so many memorable places to go: nearby there's the incredible inland waterfalls of Skradin, the unspoilt beauty of the Kornati islands, the tranquility and seclusion of Zut, the ancient fishing villages of Iz, and much, much more. You could also sail north to historic Zadar via the most heart-shaped island in the world! Aside from there being so much to see and experience, it's the dependable sunshine, reliable winds and newly built sailing infrastructure and marinas which make sailing from Jezera something that everyone should try at least once. Perfect! Jezera is close to the sailing playground that is the Kornati islands, which offers an immense range of beaches, bays and wildlife, as well as picturesque views and dependable sunshine for most of the year. 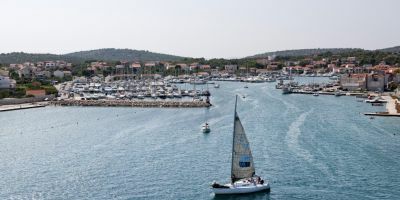 If islands aren’t your thing, Jezera is also well located to allow you to take your pick of sailing North along the mainland to Zadar, a 3,000 year old Roman settlement, or South and in-land to the waterfalls of Skradin or, further afield, the medieval island town of Trogir. A short stroll from the marina is the beautiful national park of Krka, with the seven natural waterfalls of Skradin (grab a river taxi to arrive is style, or you can walk or cycle there from Skradin town). A marine national park made up of 89 islands which offers bays, beaches, reefs and beautiful panoramic views. The local tourist board call it a ‘Sailors paradise’. An idyllic fishing village based around the ruins of a Roman fort, and with a 14th century church. Life moves at a different pace here. Jezera is a beautiful place to start the holiday, and you’re already a decent way from all the mess and noise of major civilisation – it’s a quiet town which is theoretically connected to the mainland, but which feels as though you could realistically be on an island in the middle of the Med. 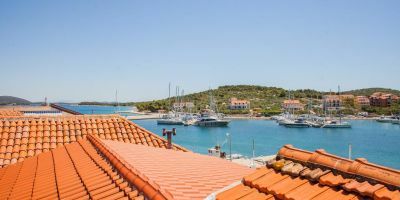 You could easily spend a few days just exploring Murter island with your yacht – both Murter and Tisno are cute little towns, which are similar but different to Jezera, and there are more than enough beautiful beaches to fill your days. 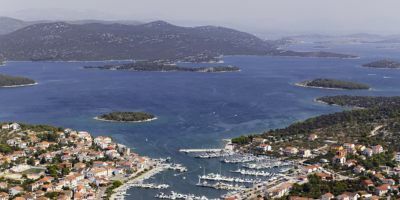 You could also head as far North as Zadar, a 3,000 year old Roman settlement, or South to Trogir, or, as we do in this itinerary, get out to the Kornati national park and explore the 89 largely uninhabited islands there, which are off the beaten track and only really navigable with your own boat. This is a 6-day itinerary because it assumes that, after checking-in and doing the shopping for the week, there won’t be time to do any significant sailing. You’ll also need to get the boat back to Jezera on the Friday evening of your charter (so that our charter partners can check over the boat ahead of changeover day), and you’ll just be checking-out on the following day – so you most likely won’t get the chance to sail on a Saturday. In total, this itinerary is 118 nM, which is roughly 20 nM a day. You should be able to sail at over 5 knots in your yacht or catamaran, which means that the sailing should only take you 4-5 hours a day. You could get out early and visit extra bays, towns and beaches en-route, or arrive early at your destination (when the marinas will be empty, and shops will be well stocked), or leave late after a lazy breakfast and doing some shopping – this is your holiday, so it’s as much about relaxing and having fun as it is about the sailing. After working out which ropes are the important ones and checking that everyone is on-board, it’s time to switch on the ships instruments, fire up the motor, and get out of the marina. 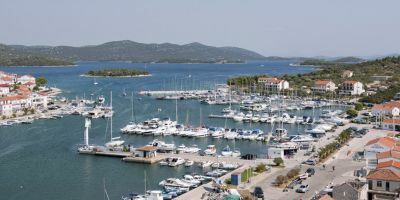 Jezera is a nice, big marina which is usually not too full, so it shouldn’t be a daunting getaway. From Jezera, we’re heading in a south-easterly direction down the coastline, with the ambition of heading in-land and ticking off one of the highlights of the sailing area in the first couple of days. The prevailing wind will be landward, meaning it should be a simple case of using a reach to head up and down the coast. Passing into the Sibenik channel is unusual for a coastal sailor, but don’t worry – the sailing is still the same. The channels you’re sailing down are a bit narrower (so there’s less scope for tacking), and there’s a road bridge to go under, but thankfully there aren’t any tides to worry about here, so there’s not much chance of ending up beached in the channel. Skradin is a small village with a number of bars and restaurants, a small supermarket, and some local markets selling fresh fish and fruit and vegetables. It’s most famous, however, for being the starting point for a trip into the Krka national park, which is home to a magnificent series of seven waterfalls. You can walk or cycle to them from Skradin, but the best and easiest way to get to them is to hop on a tourist boat from the centre of Skradin village (they’re about every 30 minutes during the day), which will whisk you up the river. Once you’re there, there’s a small entry fee to be paid, then you can spend as long as you like wandering around their nature trail and viewing the spectacular falls. You can probably walk around it in an hour and half if you get your hustle on, but it depends how mesmerising you find the waterfalls, as it’s possible to lose hours stood in front of them! (There’s also a café and ice-cream sellers to help you on your way). Skradin is a relaxed place to spend the first night of the holiday, and very well sheltered. From Skradin, we’re heading back down the in-land channel to Sibenik and back out to the sea. Once out in the open, you can weave your own way through the islands in a south-westerly direction, enjoying the thrill of being able to go in any direction you please, and not being stuck to a road or rail. 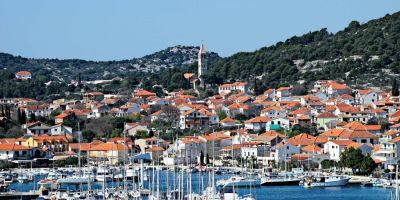 The prevailing wind should be coming straight at you so you’ll likely be beating against it as you work your way over or under the island of Kaprije, before following the coast round to find the sheltered town of Kaprije nestled in one of the bays. Kaprije is a quiet village with a population of 143 people, who are predominantly farmers of vines and olives on the island – but there’s also a few places to go for something to eat or drink. It’s only one day’s sail from the mainland, but it feels as though it could be worlds away - and the local tourist board sell this as a place to go to really escape it all. The local wine is very drinkable, and it’s obviously made all the cooler by the fact that it’s been made on such a small island. From Kaprije, we’re going to make a foray into the Kornati marine national park, which is one of the jewels of Croatian sailing, and is an area of outstanding natural beauty. It was designated a national park in 1980, mainly to protect all the plants, wildlife and sealife that lives there – it may look like scrubland at times, but there are 537 species of plants on the 89 islands, as well as 750+ species of wildlife, and a sea teeming with coral reefs, dolphins, sea turtles and all sorts of other sealife. There is a fee for entering the park, which is cheaper if you buy it in advance (if you buy from a ticket inspector, they usually charge about 50% more). The unwritten rule is that you’ll need a pass for every day you’re in the park after 4pm (the inspectors generally arrive in the early evening), so for our itinerary, you should only need to buy a 1-day pass. From Kaprije, we’re heading in a west-north-westerly direction, and weaving through the islands on a reach or broad reach in the prevailing winds. Pay attention for dolphins and sea-turtles, because this is where they like to bob around! Work your way through to the marina at Piskera, which is a relatively new marina, and was basically custom-built to make the Kornati islands a bit easier for sailors to enjoy: you won’t find a town in Piskera, though the marina does have a restaurant and a small over-priced shop (but heck, they had to get all their stock to the middle of nowhere), as well as the usual toilet facilities. From Piskera, we’re heading northwards through the Kornati islands for the day, before ending up at the relatively developed town of Veli Iz. ‘Relatively developed’ because it’s basically a small fishing village, but after the last two nights in Kaprije and Piskera, Veli Iz will seem massive! Kornati island is the longest and biggest island in the national park, and we’re following it northwards. The prevailing wind should mean this is a straight forward (and single tack) reach against the wind, then a bit of running as we wiggle through the islands, and then back to reaching after exiting the national park and heading to the island of Iz. There are two towns on the island of Iz, and we’re going to the northern-most one, Veli Iz, which is the oldest of the two (with a Roman fort and a 14th century church), the bigger of the two (with more restaurants and café’s), and more hospitable for tourists. There’s also a supermarket (Sonik) on the island to get stocked up. Step off your yacht or catamaran right into a waterfront bar. Cheers. It’s only a short hop from Veli Iz to Zut. This is our shortest day, so, if you’re up for more sailing, you could also visit Sali, which is on the east coast of nearby Dugi Otok. This is a bigger town than Veli Iz, and has a better choice of shops if you’re in need of provisions. It’s also got a gelateria, which is enough of a reason to warrant a stop in my book, particularly as it is only a short detour. We’re heading south to Zut, which should be a close reach against the prevailing summer winds. Zut is an uninhabited and tranquil island where you can enjoy getting back to basics. You’ll likely have much of it to yourself if you choose to go for a walk to explore its’ unspoilt beauty. The sheltered bay here has been so popular with sailors over the centuries that the tourist board eventually decided to install a pontoon to moor up against – but aside from the mooring, there’s just two bars/eateries and a couple of small shops (but don’t rely on either being open), and nothing else. Disappointingly, from this world of being an intrepid adventurer, it’s time to return to the real world. Or, well, Jezera for now, and you can then move on from cute fishing village to an airport and back to the real world tomorrow. Jezera is pretty much south-west of Zut, and there isn’t much to hit or worry about on the way. If you made an early start away from Zut, you might have time to look at Murter on the way, or there are some exceptional beaches on the west side of the island (which will likely have hundreds of tourists on them – this area is popular with land-lubbers too). There’s a fuel station at the marina which you should visit before berthing for the final time. 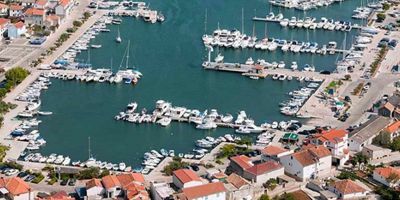 As you wait in a small queue, give thanks that you aren’t in Biograd or Trogir right now, where you can be queueing for over an hour in the fuel queue – this is one of the benefits of chartering from a small marina. Return the yacht to the vague area where you found her, secure the lines, and then we’re done. If you haven’t had chance to explore Jezera, now is a good time to stroll to the old town, where it’s usually quite lively on a Friday night. You’ll sleep on board one last time, and then it’s time to check-out, and to wonder where your yacht, your home, will be heading with it’s new family next week. Hopefully, you’ve had a perfect week of sunshine, sailing and exploring, and you’ve enjoyed seeing what nature has to offer. It was certainly a pleasure to sail with you. Hopefully the whole crew have gotten on together well, and everyone has had a great week, shared the workload, and you’ve all become better friends. Maybe you’re even planning on doing this again some time? Next week, when you’re missing the boat and feeling nostalgic, come and check out more destination guides on PlainSailing.com and start planning your next adventure! Croatia doesn’t do extreme weather. In summer, it’s hot - but not too hot - and in winter, it’s cold - but not too cold. It might sound a bit boring to some extent, but it means that the locals don’t have to worry too much about ice and snow in December, or about getting burnt to a crisp in July. These weather conditions are pretty much ideal for sailing. During the main sailing season in Jezera, you can expect temperatures to be above 20 degrees, so you should expect to be sailing in shorts and t-shirts (and not oilskins!). It peaks in July and August, but even then, temperatures are restrained and aren’t going to shoot up into the high-thirties – which means that you should be ok on a yacht or catamaran without air conditioning. Being at the top of the Adriatic channel, which itself is part of the sheltered Mediterranean, then sea temperatures don’t drop so much as they would do in the open ocean, and even at their lowest (13 degrees in January), they are still ok to swim in. They might not be pleasant, but you certainly won’t get hypothermia after a few seconds in the water. From May to September – the main sailing season - the sea gets above 20 degrees, which is perfect for just dropping the anchor and diving into the water for a refreshing cool off, before quickly drying in the sunshine. By mid-August, the sea reaches 25 degrees, which is swimming pool temperature, so you probably won’t even need to think twice about whether to jump in or not. The winds in Croatia are outstanding, and that is one of the reasons why it is one of the top sailing destinations in Europe and the world. It has super-reliable Force 3 to Force 5 winds from April to October – so reliable, in fact, that local fishermen claim they could set their watch by them. They blow from 9am till mid-day, ease off for a few hours (when the locals say that it ‘goes to lunch’) before returning, stronger, from 3pm till dusk. After dusk, the winds die right down, sometimes to nothing. The prevailing direction of these Mistral winds is landwards, and the strength can depend on the strength of the sun (the sun warms the land, which warms the air above it, which rises, and cold air is sucked off the sea to replace it). This means that it is usually easy to reach up and down the coast, and in theory, it should be just as fast to go up as down the coast. In winter, there is no such thing as a prevailing wind, so things get a lot less predictable – weather is as likely to arrive from the mountains in the North, as it is from the tropical region around the equator which is just the other side of the Med. Likewise, the strength of the winds can be anywhere from a light breeze to a howling gale – so pay attention to local weather forecasts. What is the Current Weather in Jezera? Jezera is based on Murter island, which is connected to the Croatian mainland courtesy of a big road bridge. It’s the second largest town on the island (behind Murter town), but is believed to be the oldest settlement on the island, and, like much of the settlements on the Croatian coastline, is believed to have been originally established by the Romans – the ruins at the old Roman settlement of Colentum on the island are perhaps the most exciting to go and look at. Whilst there are some historic relics, the area is best known for its array of excellent beaches, and the quality of its locally caught fish – both of which attract tourists from far and wide. Most locals, however, head to Murter for the beaches – with Slanica Cove being widely regarded as the best beach on the island (and, indeed, in the top ten for the whole of Croatia). Outside of tourism, Murter is a modern town with all the shops you might need, whilst Jezera is more of a cute fishing village – and fishing is still an important and thriving part of the island to this day. Jezera is heavily reliant upon the tourist industry, so the local tourist board arrange a number of live events throughout the summer. Jezera Days of the Sea runs from June to August, with the bigger events organised for Friday nights. In mid-August, there also the Velika Gospa fish festival where you can meet the local fishermen, taste the local fish, and enjoy local music and traditional dance. 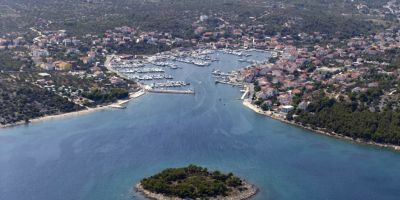 Oddly enough, the neighbouring village of Tisno is a big player in the music scene, and hosts the Love International, Suncebeat, Soundwave and Dekmantel festivals through the summer months. Konoba Kandela – this place cooks up the best seafood in town, and will have you licking your lips whilst you wait for a super-fresh locally caught fish. They also serve local wines from the region (Obala Sv.Ivana bb, Jezera 22242). Konoba Denis – If you’re more after meat than fish, then this place is the best grill in town, and will sort you out with decent grilled meats, or, better, grilled fish. You can choose your fish, and watch the chef cooking your dinner at a charcoal grill in the back (Trg Rudina 15, Jezera 22240). Jezera might not be the wildest holiday destination, but there’s still plenty of holiday makers, many of whom like to drink into the night. The best way of following the action is to wander around the town (it’s only a small town) and see which places are buzzing (it varies by the night). Alternatively, find yourself a nice place to sit and wait for everyone else to come to join you – though this only really works if there’s five or six of you and you look like you’re having fun! Caffe Bar Juno – a cheap bar with a great view over the marina, which will serve you a decent enough coffee during the day, and a decent enough cocktail or beer during the night. Lively on a Friday night (Obala Sv. Ivana 14, Jezera). Beach Bar Debeli Krug – a beach bar located at the edge of the bay, looking out onto Skoljic island. A relaxing place to sit, particularly if the sun is still shining. You can nip out for a swim in between sips! (Put Zaratića 53, Jezera). Stars Palace – c. £50 for a double room – situated overlooking the harbour, the hotel couldn’t be better located for the marina. There’s a garden and a swimming pool, and you’re just 100m from the beach. They offer an airport shuttle service. Heritage Hotel Tisno – c. £80 for a double room – located in Tisno, which is the next town to Jezera, a couple of kilometres away. This hotel is the best on the island of Murter and would make a great place to stay if you were going to be here for a couple of nights. Located on the waterfront in Tisno, it's bound to whet your appetite for sailing. Apartamani Bruna *** - c. £40-80 for a double room – these fully furnished apartments are well located, very reasonably priced, and can accommodate up to four people. Jezera marina is an impressive and award-winning marina with all the trappings you would expect from a modern Croatian marina – there’s wifi, a restaurant, a bureau de change, and even a swimming pool for visitors - on top of all the usual toilet, launderette, mini-market and refuelling facilities. The marina is just a short stroll from the historic Jezera town, where churches, bars and tavernas lining the harbour waterfront. The whole of Murter island is famous for its amazing beaches. The nearest useful supermarket (though still not massive) is the Konzum, which is about 600m away on the other side of the harbour, and on the main road away from harbour towards Tisno. Though no massive, there’s a big enough range to keep your whole crew happy. The address is Ul. Donji put 24, Jezera. Jezera is easily accessible by road, with Murter island being linked to the mainland via a road bridge. The nearest airports of Split and Zadar serve many budget airlines, including Ryanair, and are less than two hours drive away – we can help you arrange a transfer. 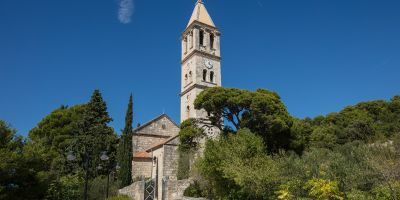 Public transport is an option to arrive at Jezera from the airports, but involves heading into Split or Zadar town centres and then catching a bus along the coast, which can be very time consuming, and some services to Murter island only run once a day.